The Ultimate in Sun Control for Windows, Patios, and More! Our Premier Custom Roll Up Sun Shades come with a coordinated valance and have a continuous loop chain with a clutch control to keep the shade at the height you want. 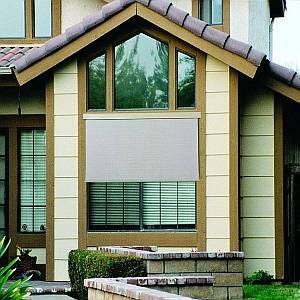 Coolaroo Exterior Window Shades are the ideal product for reducing temperature within your home. Made from Coolaroo's unique knitted all weather fabric, these exterior window shades block up to 80% of the sun's UV rays yet still allow air to flow through. This breathable fabric not only significantly reduces temperatures behind the window shade, but still allows just the right amount of light transmission to ensure you can always see what's happening outside. 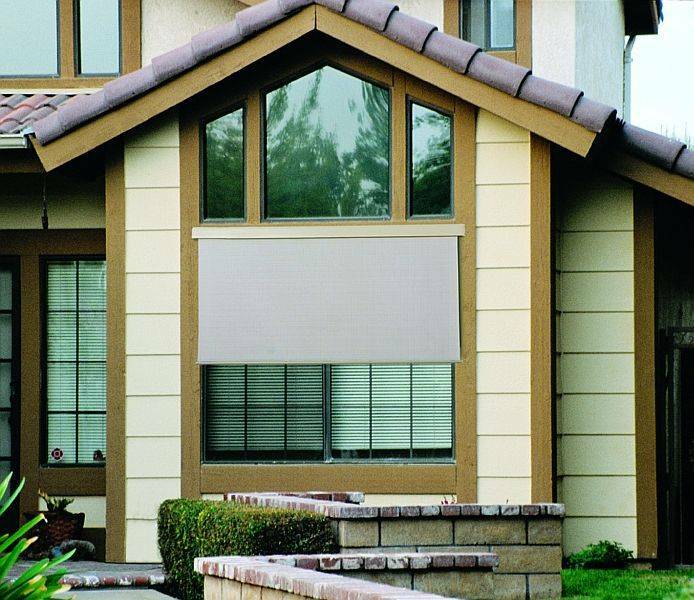 Solar Shades eliminate many of the sun's harmful rays with a specially designed fabric. It also protects your furnishings from harmful UV rays while reducing heat and glare! Our fabric stops the sun's heat before it strikes your window, thus reducing the heat transfer. As a result, your home or business stays cooler. Reduces room temperature up to 15%, saves energy, saves dollars. Protection from prying eyes is an additional benefit of our Custom Sun Shade fabric, allowing you the utmost in daytime privacy (under most conditions). You can see out, but they can't see in! This is not a "blackout" shade; light will come through. All shades are measured from Outside Bracket to Outside Bracket. Brackets are universal. They work for ceiling (top mount), or wall (side mount). You will need 2 1/4" tall x 3" away from surface to mount brackets. 2 3/4" less if width measurement is over 48"
Continuous Chain. Choose the length of chain that hangs from the valance:The following drops are available 2ft, 3ft, 3.5ft, 4ft, 5ft, 6ft, 7ft, 8ft, 9ft, 10ft, 12ft, 14ft, and 16ft. Chain tension can be adjusted if too tight or loose. Clutch Control Chain Clutch comes standard on the right. Can be mounted on the left. Our shades are shipped standard forward roll (rolls off front). You can order a reverse roll (rolls off back). Clutch, idle end, brackets, and bottom rail are designed to compliment cloth color. Pattern of weave is vertical unless shade's length is over 96". If length is over 96", pattern is then horizontal. 5 inches of cloth is automatically added to length to allow shade cloth to remain wrapped around tube. If shade cloth measures more than 96" in width, maximum length can only be 96". After production, actual cloth length will be 94" (without allowing cloth to be wrapped around tube). Shade cloth is made from a single piece of fabric. No Seams! Valances are color matched to the fabric as closely as possible -- No special order valances are available. Click to view a gallery of images as well as close up images of the different parts of these Solar Shades & Custom Window Shades. Lead time to ship will be 3 to 6 weeks depending on the season. Shipping will take 2-15 business days after lead time. All custom solar shades are made to your specifications. Therefore, all sales are final. No refunds or returns can, or will, be accepted. To Order Online: Click below on the shade size in which you are interested, fill out the information, and add the item to your shopping cart. Availability: Usually ships in about 3-4 weeks.